This refreshingly tart rhubarb vinaigrette was inspired by having a couple of stalks leftover after making a rhubarb galette. Beyond dressing salad greens, it’s slightly fruity flavor pairs well with grilled meats, such as pork, chicken or fish; with sautéed duck breast or a confit; or in a chunky chicken or summery bean salad. 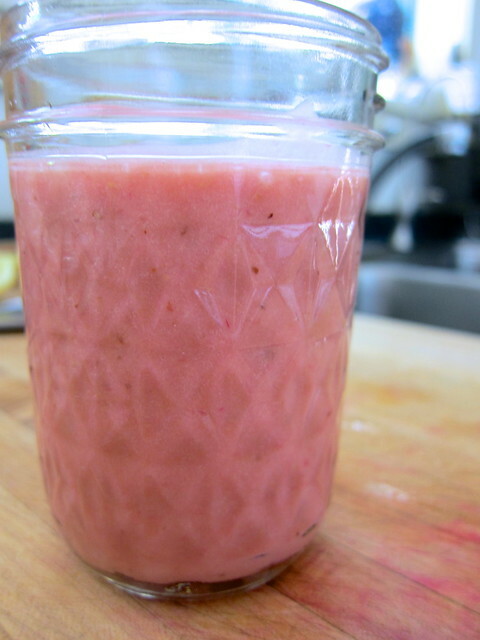 Simply simmer the rhubarb until falling apart, then blend with the remaining ingredients until emulsified. We choose a local cider vinegar, though red wine, rice or even raspberry vinegar would also do. For this batch, we used a grainy mustard; creme fraiche makes for creamier version, or omit them altogether for a lighter one. And if you have a couple of strawberries on hand, throw them in for an extra fruity punch. – In a small saucepan, bring the rhubarb and water to a simmer, and cook until very soft, about 5 minutes. 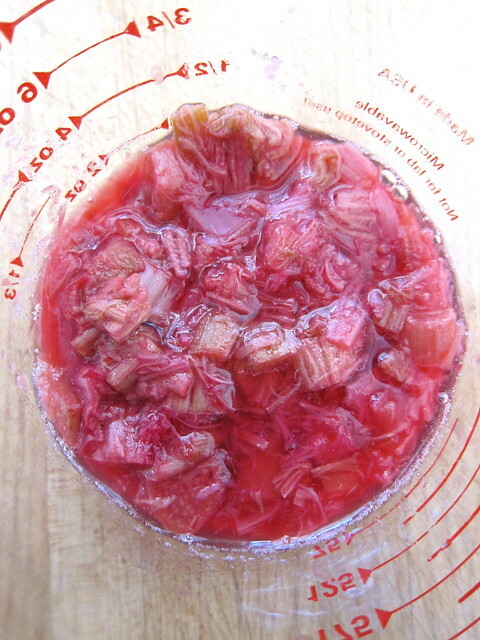 Remove from heat and let cool; should make about ¼ cup cooked rhubarb. – Place the cooked rhubarb, honey, cider vinegar, and mustard or creme fraiche (if using) into a blender or small food processor. With the motor running, slowly pouring in the oil to form an emulsified vinaigrette. Makes about 1 cup. Local ingredients: Honey from Victory Bees; cider vinegar from Sewall Orchard; mustard from Cheshire Garden; sunflower oil from Coppal House Farm; rhubarb from the garden. This entry was posted in cooking and tagged dressing, rhubarb, salad, salad days, vinaigrette. Bookmark the permalink. This dressing sounds delicious, love the color. Pinned. As they say, we eat with our eyes first! How very clever! I’m going to have to try that. In my early days of cooking, raspberry vinaigrette was all the rage, and was the original inspiration for this! Looks delicious! I think cranberries and rhubarb are both wonderful with roasted chicken -yummy!